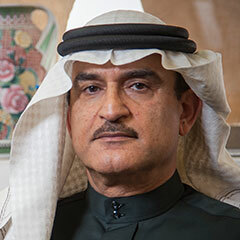 Dr. Abu-Khamsin joined the Department of Petroleum Engineering, KFUPM, in 1984 and is currently an adjunct professor. He assumed chairmanship of the Department during 2004 – 2010. He is the petroleum-engineering editor for the Arabian Journal for Science & Engineering, a member of KFUPM’s Scientific Council, and a member of the Council of the College of Petroleum Engineering & Geosciences. Ph.D., Petroleum Engineering, Stanford University, USA, 1984. M.Sc., Chemical Engineering, KFUPM, KSA, 1978. B.Sc., First Honors, Chemical Engineering, KFUPM, KSA, 1975. Reservoir engineering and Enhanced Oil Recovery. Abu-Khamsin, S.A., Brigham, W.E., and Ramey, H.J., Jr.: “Reaction Kinetics of Fuel Formation for In-Situ Combustion”, SPE Reservoir Engineering, 3:4, Nov.1988, pp. 1308-1316. Abu-Khamsin, S.A., and Al-Marhoun, M.A. : “Development of a New Correlation for Bubble Point Oil Viscosity”, Arabian Journal of Science & Engineering, 16:2A, April 1991. Okasha, T.M., Menouar, H.K., and Abu-Khamsin, S.A.: “Oil Recovery from Tarmat Reservoirs Using Hot Water and Solvent Flooding,” Journal of Canadian Petroleum Technology, 37:4, April 1998, pp. 33 – 40. Osman, E.A., Aggour, M.A., and Abu-Khamsin, S.A.: “In-Situ Sand Consolidation by Low-Temperature Oxidation,” SPE Production & Facilities, 15:1, February 2000, pp. 42-49. Abu-Khamsin, S.A., Iddris A., and Aggour, M.A. : “The Spontaneous Ignition Potential of a Super-Light Crude Oil,” Fuel, 80:10, August 2001, pp. 1415-1420. Al-Mutairi, S.M., Abu-Khamsin, S.A., and Hossain, M.E. : “A New Rigorous Mathematical Model to Describe Immiscible CO2-Oil Flow in Porous Media,” Journal of Porous Media, 17:5, 2014, pp. 421 – 429. Distinguished Membership Award, Society of Petroleum Engineers International, 2017. Distinguished Achievement Award for Petroleum Engineering Faculty (Middle East Region), Society of Petroleum Engineers International, 2014. King Abdul-Aziz Order Medal of the First Degree, The Royal Court, KSA, 2004. Distinguished Teaching Award, College of Engineering Sciences, KFUPM, 1996, 2015. Distinguished Achievements Award, Department of Petroleum Engineering, KFUPM, 1998-1999.